Humidity is necessary to keep an instrument from drying out, shrinking and cracking. 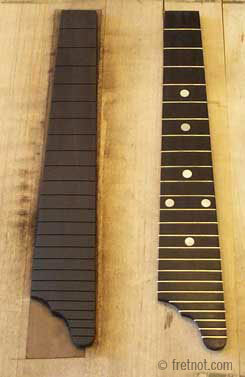 A dry fingerboard can split and/or allow frets to spring loose. While it is impossible to keep a dried out vintage fingerboard from chipping when pulling frets, one should expect all such chipping to be repaired prior to fret installation. While this may only be cosmetic in nature, chipping around fret slots may promote loose frets. Many vintage inlays were made from celluloid that can shrink considerably. It is best to secure these as soon as possible to prevent loss or cracking. This is rarely seen on newer instruments. I have encountered this on vintage instruments with hand slotted fingerboards and on some very inexpensive import mandolins whose owners were helpless to intonate. Because the fret's position determines the note, each and every fret must be properly laid out to ensure the instrument plays in tune. To verify the suspicion one must know the scale length and measure each fret's placement. As I mention above, replacing a fingerboard is a repair usually reserved for expensive/valuable instruments due to it's cost. Here you see me re-producing a vintage fingerboard. After the fingerboard is slotted I cut the outline shape, install any inlays, radius the fingerboard, bind if necessary (wait if nubs are desired) and prepare for installation. I choose to install frets after gluing the board to the neck in case the moisture in the glue introduces any wave or cupping into the fingerboard. After frets are installed they are leveled, dressed and the instrument is set up.